by Christiane Herzog, Doubleday, first English edition, 2000. Hardback with DJ, 159 pages. 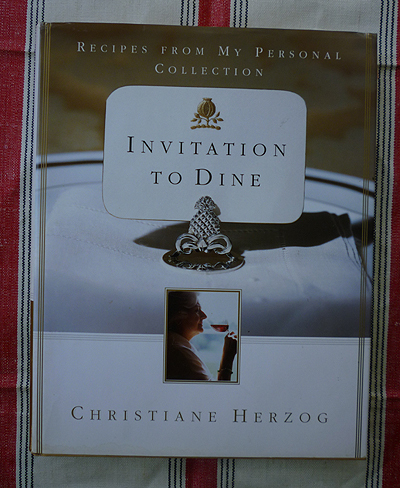 The recipes in this book by the late former First Lady of Germany (1994-98) are stunning, and frankly, they took us by surprise. We were expecting the German version of down-home cooking. Well, it is and it isn't --while many recipes are simple, overall they are precise and complex if not complicated, and all of them show that Herzog was not an amateur in the kitchen. In the preface, she prepares you for "good, plain cooking," much of it from recipes handed down by a great-grandmother, both grandmothers, her mother-in-law and other relatives, mostly in the southern German style. Towns and regions from which they are drawn include Nürnberg, Regensburg and the French-influenced Vogtland. Yet her remarks about the recipe collection begin to hint that this is not an ordinary "Frau" sauerkraut cookbook: ""Because I grew up in the Allgau region, there was no way I could omit Kasepatzen and Quarkknudel, which are called Ziegernudlen in the Allgau. The Maultaschen (ravioli) are carried over from my time in Baden-Wurttemberg, and I was served Upper Palatinate Dotsch, which went by the name Pillekuchen during our years in Bonn." The very first recipe in the book sets the tone: Chicken Liver Terrine (Gerflugelleberpastete). First are the ingredients for the puff pastry, and then for the filling, and then the elaborate assembly. This is followed by Grandmother's Beef Brawn (Fleischulze GroBmutters Verfahrenweise). Yes, calf's feet, pig ears, pig trotters and beef flank are involved, so it's down home, alright, but this was to be served as an hors d'oeuvre at state functions. And so it goes through out the book ... French Fish Soup...Paupiettes of Beef...Lamb Strudel...Partridge in Madeira. Quite something. Recommended. VG+/VG+.